It was a tradition, always, that my father wrapped the presents. I’d even seen it go so far as for him to wrap his own, cleverly camouflaged in nondescript boxes provided by department stores the year before. I often questioned how the tradition came about, and considered whether his yearly holiday task had started in his tender years. I found myself imagining him as a small boy, rummaging around in the bin of colorful paper and juggling scissors and cellophane tape. There was no question as to why the tradition continued. No one compared. His skill in fitting the paper. Always efficiently using only what was necessary to conceal the package within. The corners never gaped, and no matter the shape, he managed to create neat edges on all those brightly covered items arranged decorously around the tree. At some point my independent spirit rebelled and I demanded my share in the holy wrapping ritual. I was graciously allowed to try my small hand at the task. I cannot precisely recall whether my efforts resulted in triumph, but I must not have done too badly as it soon became our shared chore. Not so much dreaded as relished. The time spent together estimating paper and ribbon, drinking hot chocolate or coffee, and listening to Bing Crosby and the Andrews Sisters, Perry Como, or Tennessee Ernie Ford. The lights that made patterns on the ceiling changed through the years from multicolored flashes the small, white twinkling points. The tradition remained. And as the time passed, new parts of my life invaded my sacred rite. Frequently working holidays in the emergency rooms, I would cross my fingers and race to the house, not even daring to pray that the pager would remain silent for fear of rousing the crisis gods and keep me from my wrapping with dad. It didn’t always work, but he tried to save me at least one, to keep our pact as the family wrappers. It almost seems a metaphor now, as I think back. My father wrapped those gifts just as he wrapped our family, smoothing edges, tying loose ends, managing the dodgy elements that would mar someone’s experience. Yep, my dad did that. I never realized it for so long. Then, he was gone. I remember that first year. I think I put everything in gift bags. It was a cheat. I just couldn’t bring myself to attempt the task alone. And I couldn’t ask anyone to help. Everyone else was suffering the same, well… almost the same grief. We all dealt with it our own way. Little by little, I found myself stepping back into the position. Never fully. I could never fill those shoes. So, as I sat in the middle of the living room floor, wrapping presents, the memories flooding back. It wasn’t the same, sitting here alone and thinking as I fold each corner. Then, I caught myself. That frown. The way my hand folded the corner and I was carful to fold the cut edge to make a smooth edge on the end of a difficult package. I stopped, stunned for a moment. I looked down at my hands at the nails that were more rounded than my mother’s. I saw my hands, built on a larger scale than most women, but the lines more delicate than would be considered masculine. I saw through the lens of memory my father’s hands guiding mine to fold the edges and place the tape. My eyes clouded. Had I hardened myself so much to fear of pain that I had also blocked the other part of my sacred charge, joy? That was what my dad always tried to protect, even when we moved and we didn’t have a tree or our old vinyl albums or any of the other anchor to the holiday traditions of home half way around the world. I stared a while longer before returning to my task. I wrapped every gift. I regretted the reduction in number. 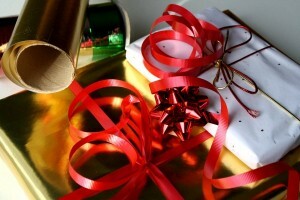 Sadly, the reduction of individuals in our holiday gathering has changed the way we approach gifting. In years past, the sheer number of people created a mountain of gift offerings under the bedecked tree. Through the years, those of us left have attempted to replicate the appearance through expenditure (that most of us could ill afford). This was a mistake. The number of packages or zeros is inconsequential to the love and good will of spending time will of family and friends. Yeah, that’s all kinds of cheesy. I know it. It makes my back right molar ache a little typing it. Regardless, it is the realization that dawned upon me as I tried valiantly to coral the few boxes that were before me to bedeck with festive paper. I finished my self imposed “chore”. I looked at the packages, arranged beneath the tree to best advantage despite the diminutive number. I realized that I had chosen paper as dad would have. No tags necessary because of the number, but also because of the way the paper and package spoke of the recipient. I was correct in my anger towards the television commercials that stressed the importance of spending more money. Spending time is what matters. So, this blog has turned into one of those sappy, emotion-ridden, epistles chastising you, like Ebeneezer to repent your monetary ways and seek the true meaning of Christmas (Ham? No, not ham you fat @#$%). However, that was not the intent of this particular (wordy) first entry into the world of blog. It was to say that this Grinch’s frozen heart was thawed slightly today. In memory of one who quietly loved the season, loved his family, and held it together without ceremony or letting anyone else know it. May I carry that spirit beyond holidays to safeguard those who are dear to me, and may any reading this have a blessed holiday (with no reservation to any particular faith) and may your new year blessed in every way.